The conference will be held at the Grosshadern Campus of the University Hospital, Munich. The S-Bahn, or suburban train, lines S8 and S1 each leave every 20 minutes from the airport to the central train station (Hauptbahnhof). They take different routes, but both hit all the main city stations and pass through Marienplatz in the heart of Munich. 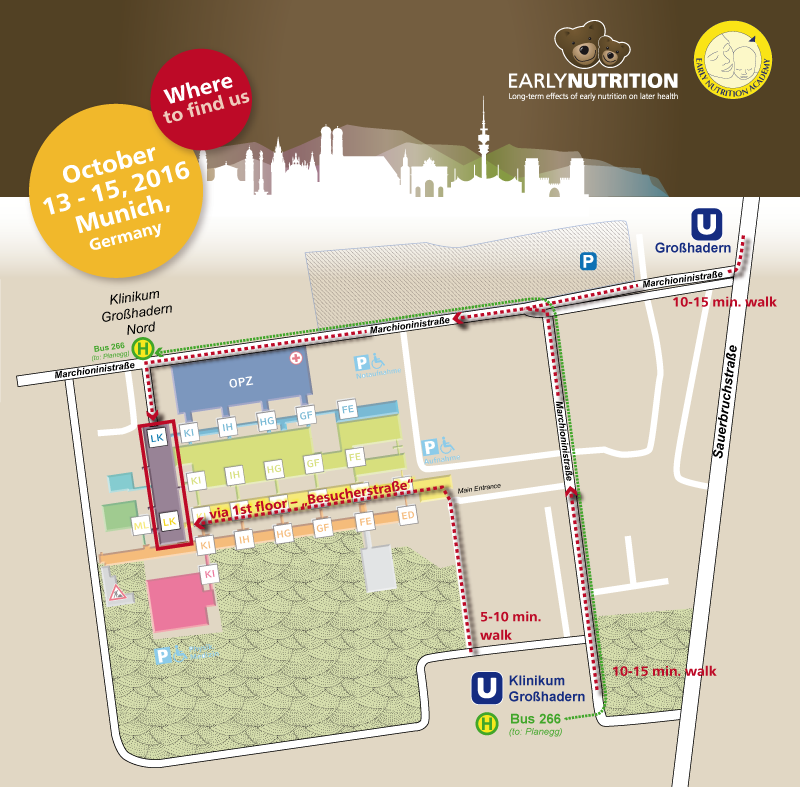 At Marienplatz – change to Underground Line U6 towards Klinikum Grosshadern (last stop). Go to Main entrance of Grosshadern Medical Center and follow the signs. The whole trip from airport to the university hospital Grosshadern takes approximately 50 minutes. Please take the subway line U1 (direction "Mangfallplatz") or U2 (direction "Messestadt Ost") to Sendlinger Tor (one stop from the Hauptbahnhof / central station) and change to the subway line U6, terminus "Klinikum Grosshadern". The Klinikum Grosshadern can be found under the categories "Hospital" and under the keyword "University” or alternatively via the adress Marchioninistrasse 15, 81377 Munich, Germany. Take the "Autobahn" to Munich and change at junction to A92 in direction Munich-West/Stuttgart. After about 20km at junction München-Feldmoching change to A99, go on for about 18km until you pass the junction "Autobahn-Dreieck München-Süd-West". Take the A96 in direction Munich Centre until exit "Blumenau", proceed in direction "Grosshadern". After about 500m the Marchioninistraße is on your right hand side. There are free parking spaces available for visitors and patients. Follow "Mittlerer Ring West". At the junction "München-Sendling" proceed to Autobahn A96 in direction of Stuttgart. Leave at exit "Blumenau" and proceed in direction "Grosshadern". After about 500m the Marchioninistraße is on your right hand side. There are parking spaces available for visitors and patients.